Voluntourism or volunteer tourism is a growing vacation trend nationwide, and Colorado voluntourism opportunities in particular have a distinct advantage: Not only is your vacation a feel-good experience, you also get to see some Colorado's most beautiful scenery. If you like to hike on your vacations, the chance to hike, camp and help build the trail you're enjoying is an immensely rewarding experience. Four organizations within the state are dedicated to maintaining Colorado's thousands of miles of hiking trails for generations of hikers and wilderness lovers to come. Contact these individual non-profits to find out what voluntourism activities are available during your visit. Colorado is endowed with 58 mountains whose peaks rise at least 14,000 feet above sea level — more than any other state in North America. Because of this lofty distinction, many adventure seekers have been challenging themselves to climb these behemoths for decades. The heavy foot traffic on these high-altitude trails can be hard on the ecosystems, causing more damage than wind and rain. Climbing these giant fourteeners is a signature Colorado achievement that everyone wants to ensure remains intact for future generations. The Colorado Fourteeners Initiative is a non-profit, volunteer-dependent organization that helps restore and maintain the trails and fragile plant life. Volunteer vacations range from three-day trail builds while camping near the work site — sometimes near the summit — to wildflower-seed collection, where the seeds from native flowers will be used to repopulate barren trails. The Colorado Trail stretches 500 miles from Denver to Durango. One of the nation's premier long-distance trails, it's a pathway for hikers who want to travel the majority of the state on foot, passing over mountains, around lakes and through a number of Colorado communities. The Colorado Trail Foundation is the caretaker of this challenging hike, which takes a minimum for 21 days to complete in its entirety. Volunteers are continually working on maintaining its varied terrain. Each year, the foundation's roughly 20 volunteer crews make improvements to the trail, and visitors to Colorado are welcome to take part in the weeklong trips. The excursions require good physical stamina and backcountry camping experience, but the rewards are days spent in some of North America's most pristine wilderness. The Continental Divide Trail follows the United States’ claim to the Continental Divide from Montana to New Mexico, running though Idaho, Wyoming and Colorado. In all, more than 3,000 miles of hiking trails constitute this grand route. As with the other trail-stewardship programs, no previous experience is required to help out on the Continental Divide Trial. Projects with the organization range from repairing damaged sections to scouting missing trail links to building unfinished sections.You can also pick up a shovel to join the trail crew, become a team leader, cook for trail crews, adopt a section of the trail or even volunteer in the alliance's Golden office. Volunteers for Outdoor Colorado (VOC) is a nonprofit organization dedicated to engaging the public to care for Colorado’s outdoors and natural resources through volunteerism. VOC hosts a variety of statewide programs that help revitalize areas such as federal and state parks, open spaces, wilderness and backcountry areas, mountains and fourteeners, wetlands, wildlife habitats and other lands that benefit the public. From one-day excursions to restore or construct Colorado’s trails and habitats to multi-day stewardship adventures, VOC’s volunteer program engages thousands of volunteers each year. Examples of projects include expanding the bison-viewing area at Genesee National Park and trail construction and native planning at Sloan’s Lake in Edgewater. The organization also offers family-friendly volunteer opportunities to encourage youth involvement in preserving the future of Colorado’s natural habitats and outdoor leadership training programs. 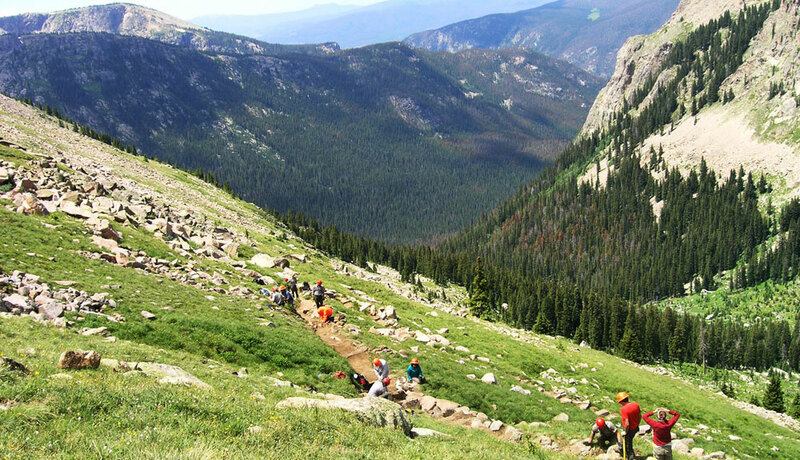 Photo: Rocky Mountain National Park trail repair volunteers; photo courtesy of the Continental Divide Trail Alliance.